Timing shadows from the Kuiper belt! Any news? Did it work? update 24-Jun-2017: SOFIA Arrives in New Zealand to Observe Southern Skies There are plans to fly SOFIA through another predicted occultation path on July 17. SOFIA is a huge (2.5 meter dia.) infrared telescope (1 ~ 250 um) with various cryogenic focal plane arrays that is flown above most of the water in Earth's atmosphere (YouTube). It sound like they will just use the visible light guide camera (behind the Nasmyth mirror? ), rather than the infrared capability, but the portability is certainly handy. This mission might be "An Airplane Hunting for Shadows from the Kuiper Belt". The stellar "shadow" cast by 2014 MU69 took about 11 minutes to sweep across Earth, so from any given location the star would disappear for no more than about 2 seconds. Since the cameras were making ½-second-long exposures, at most four frames will show the star missing. But even with such beefy telescopes, the expected signal-to-noise ratio (even in optimal conditions) won't be high. So did anyone see the star disappear? Anja Genade (SAAO) reports good data but no disappearance with the 74-inch Radcliffe reflector in Sutherland. As for all those mobile teams, Buie isn't saying — at least just yet. Look for him to announce those results early next week. which suggests an occultation was successful, but I'm not sure of the definition of success in the tweet yet. Still looking for more info on this amazing group effort. There are two more similar occultations predicted for early July in AsteroidOccultations.com's News & Announcements for 2014 MU69, I hope we'll hear something more about this one before then. The predicted time of the first of three occultations of +12 to +14 magnitude stars by asteroid 2014 MU69 has come and passed. People have fanned out over South America and South Africa with telescopes with cameras and GPS clocks and are going to try to watch the shadow of a roughly magnitude +13 star cast by a rock in the KUIPER BELT pass over the Earth! 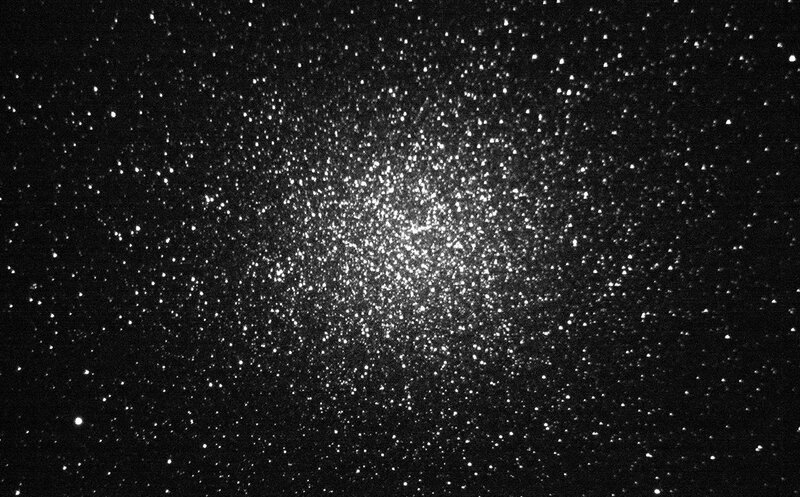 This is of course weather permitting, and early Twitter reports are already showing clear skies and images of the Omega Centauri star cluster. There is a Twitter hash tag for these events, #mu69occ. Here is a 500 millisecond exposure from a few days ago. The short exposure time is necessary to resolve small scale debris from the main occultation. above: Omega Centari Star Cluster, 500 millisecond exposure. Tweeted by Alex Partker. The goal is actually to look for shadows cast by even smaller debris, orbiting around the rock in the Kuiper belt. This is for New Horizons mission planning. When will we hear at least a little news? Did anyone see a dip in a light curve at all? Something? “What about the results? Did you see the occultation?” you ask. Everyone asks this. Right now, we don’t know yet. This was an extremely challenging occultation to observe. 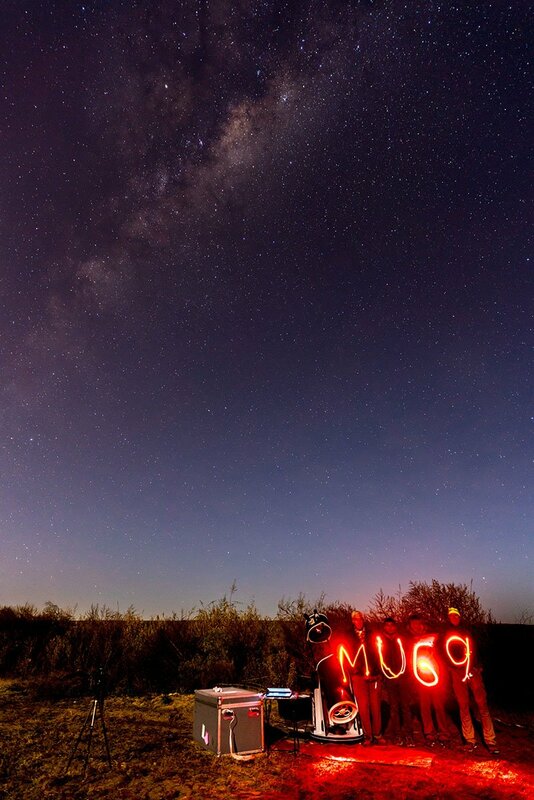 MU69 occulted a very dim star, which always makes the observation tough. On top of that, we need to combine data from 24 deployed sites, plus some fixed sites, that cover a wide range of conditions, including seeing and illumination. Therefore, the data analysis will take awhile. It is likely that only a couple of the telescopes actually observed the occultation. All of the data, however, will be useful for the New Horizons mission. All of us—astronomers and the general public—just need to wait until the New Horizons team finishes the analysis and announces the results. I am not a New Horizons team member, so I am eagerly awaiting the results like everyone else. MU69 has three stellar occultations this summer—June 3rd, July 10th, and July 17th. Combined, the pre-positioned mobile telescopes captured more than 100,000 images of the occultation star that can be used to assess the environment around this Kuiper Belt object (KBO). While MU69 itself eluded direct detection, the June 3 data provided valuable and unexpected insights that have already helped New Horizons. “These data show that MU69 might not be as dark or as large as some expected,” said occultation team leader Marc Buie, a New Horizons science team member from Southwest Research Institute (SwRI) in Boulder, Colorado. 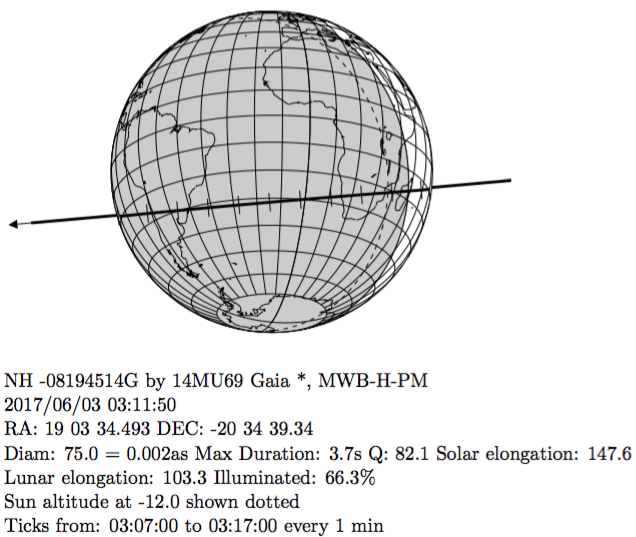 Initial estimates of MU69’s diameter, based primarily on data taken by the Hubble Space Telescope since the KBO’s discovery in 2014, fall in the 12-25-mile (20-40-kilometer) range – though data from this summer’s ground-based occultation observations might imply it’s at or even below the smallest sizes expected before the June 3 occultation. Besides MU69’s size, the readings offer details on other aspects of the Kuiper Belt object. Analysis of the data is still ongoing. Not the answer you're looking for? Browse other questions tagged orbital-mechanics asteroid new-horizons 2014-mu69 or ask your own question. Two week mark; has Mayak (Маяк) been spotted yet? Reflector deployed? Astronomy “ruined”? What's after the Kuiper Belt for New Horizons? Are there clusters of small asteroids in the Kuiper or asteroid belt which could threaten the Earth? Can James Webb see Kuiper Belt Objects like 2014 MU69 (Ultima Thule)? Traveling through the asteriod belt?